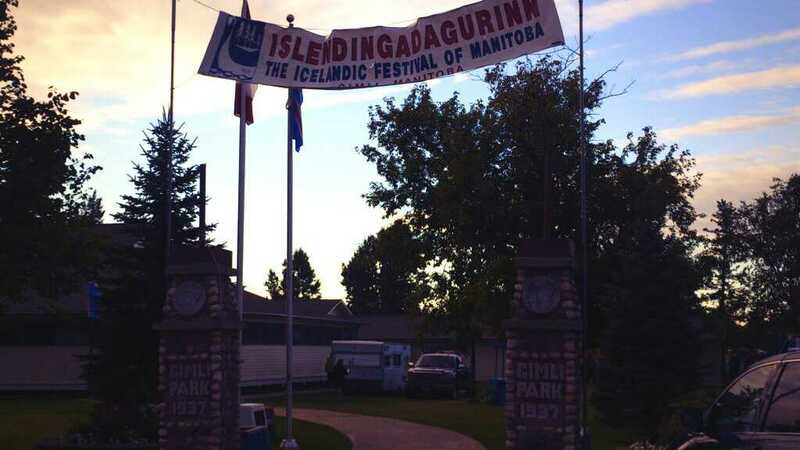 I was fortunate enough to spend the August long weekend at Islendingadagurinn, the Icelandic Festival of Manitoba. Wendy and I have attended before, but only as a day trip, a zip into the viking village, and a tasty burger at The Beach Boy, and back on the highway home. This visit was a little different. One of the organizers of the MTS Viking Village arranged for me to be a guest of the New Iceland Heritage Museum, where I gave four readings from Thunder Road and one brief teaser from Tombstone Blues. Since my readings were on the Saturday and Monday of the long weekend, I decided to stay in Gimli and take in the entire festival. After arriving late on Friday, Wendy and I walked around the Viking Village (it had already closed up for the night) and took in the sights. The fish flies were basically done for the year, which was nice (especially for Wendy). I’m actually surprised that I managed to book a room in time, and our balcony had a lovely view of the harbour and the fireworks (which, after too much sun, I slept through. But I’ve been told they were excellent). I was even recognized by one of the vikings. 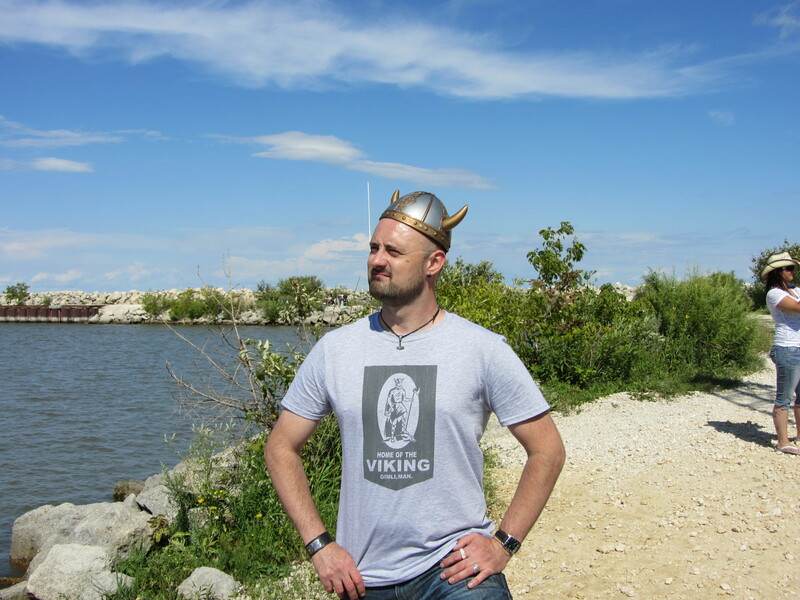 Normally, if you see a bald man roaming around Manitoba with a Thor’s hammer pendant around his neck and Niddhogg the dragon on his T-shirt, you probably have even odds that its me. Islendingadagurinn probably skews those odds more than a little. 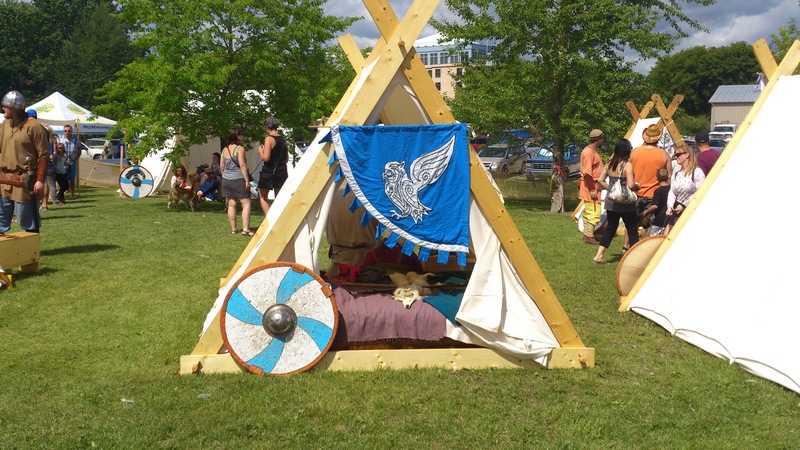 And to be fair, the viking who recognized me was Mike Cichon, the man who invited me up to the festival. But Mike and I had never met, and had previously only corresponded by email, so I’m counting it. 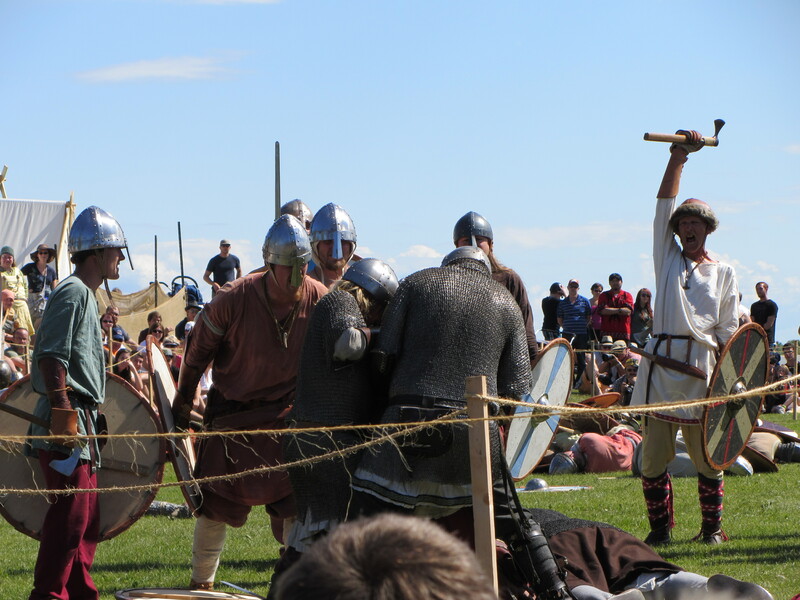 The MTS Viking Village, now in its tenth year, is probably the big draw of the festival for those not of Icelandic descent. 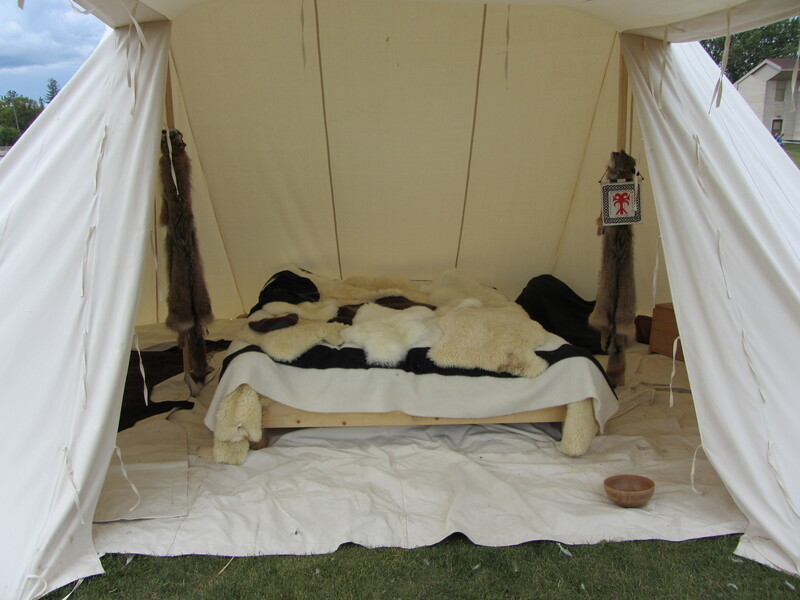 Dedicated volunteers in period costume come from all over Canada (and far beyond, in some cases), live in a tent city overlooking Lake Winnipeg, and cook over open fires, forge tools, dye wool, and answer questions for the public. Food in the village smelled so good, but visitors weren’t allowed to try any of it (insurance reasons, I was told), so I settled for picking up the cookbook of what they were eating over the week they were in character. And why not, it was available with a token donation to the Dark Ages Relief Fund to help re-creators who’ve fallen on hard times. 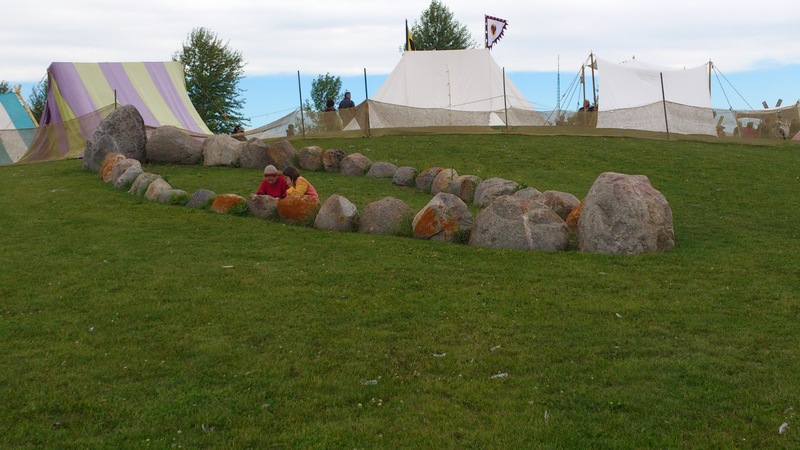 Unfortunately, there was no longship on the lake this year, but I did find this, which a couple of viking children were pretending was their longship (and the seas were stormy, my friends). 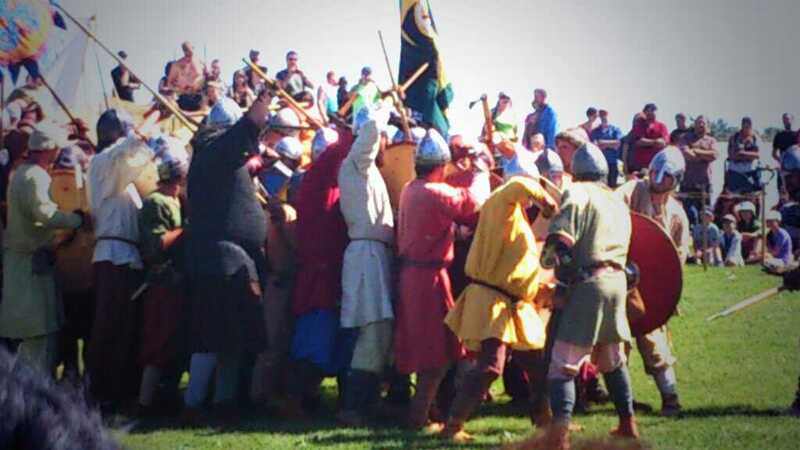 They also put many combat demonstrations in large and small scales. If you want to learn more, you should check out the Vinland Vikings, Sons of Fenrir, and Odin’s Ravens. 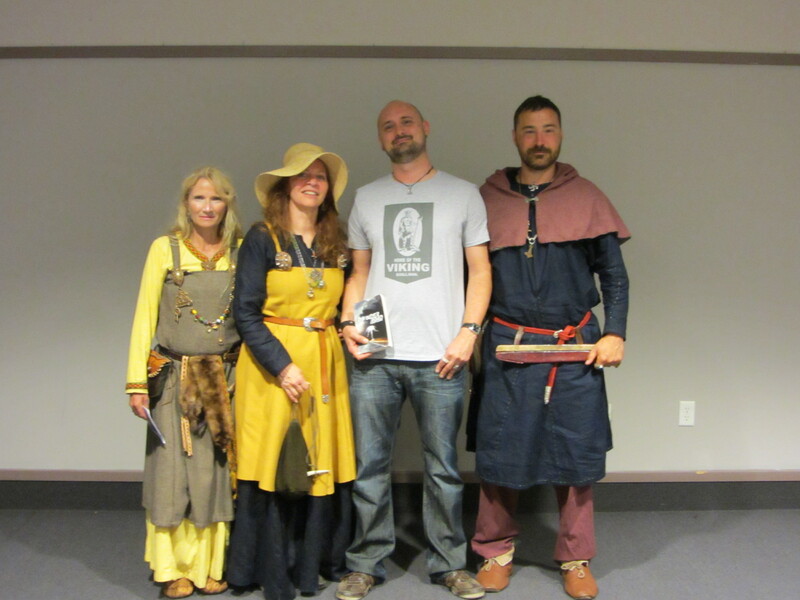 They put on an awesome show, and if you want to write about the viking age, you could do worse than to talk to these fine folks. Throw on some armour, heft a sword, let the sun pound down on your conical helm, and inject a little reality into your fantasy writing. 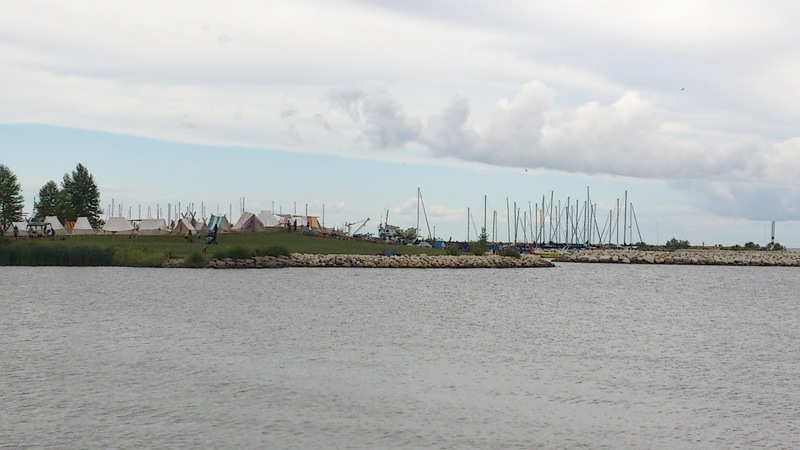 When you walk down the south side of Gimli, and you look back at the harbour, you can almost believe it’s a real viking village that waits for you. Our friends, Brent and Laura came up for a visit. 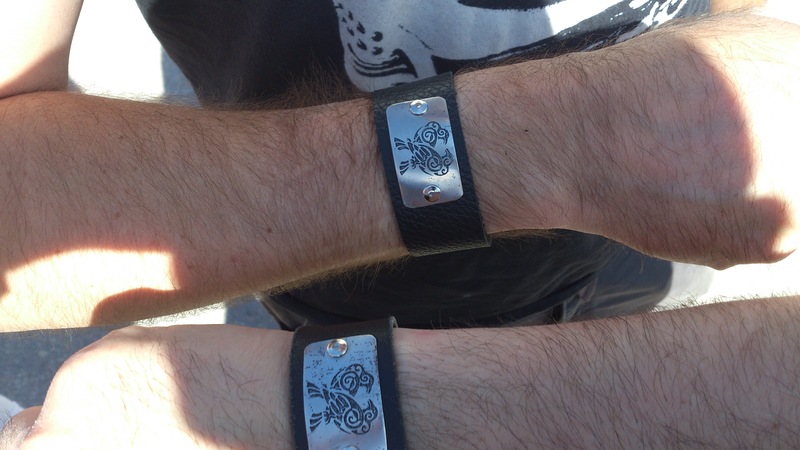 Brent is also a huge fan of Norse myth (and has been an amazing booster for my work), and in addition to us each having Huginn and Muninn tattoos, we now share leather wrist cuffs with stainless steel ravens, courtesy of the artisans at Quicksilver Halo. 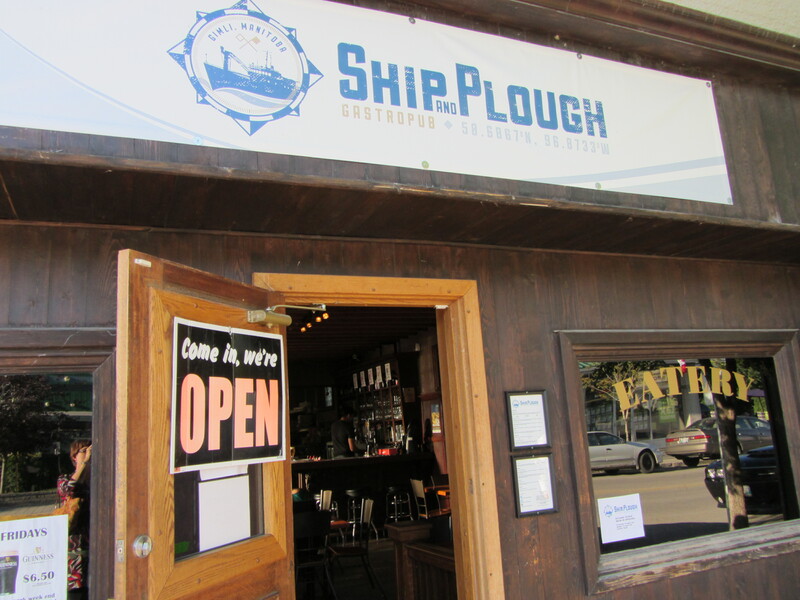 The four of us took in dinner and drinks at Gimli gastropub, Ship and Plough, which I highly recommend. 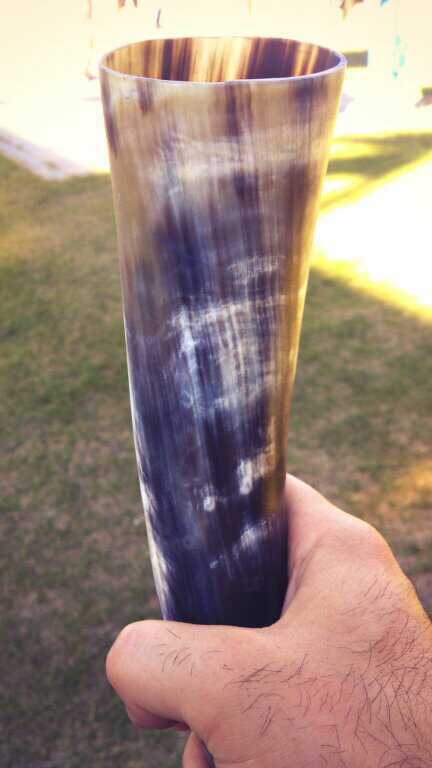 Speaking of drinks, one of my purchases in the Viking Village was a drinking horn. Brent grabbed one too, and at least five people asked us where we got our drinking horns. Maybe I should start selling those, instead of books. It didn’t take too long before I had an Icelandic beer (Thule) in that horn, either. How was it? The beer tasted fine, but every time I raised it up to take a fresh slug, I got a whiff of…well, horn. One of the vikings suggested coating the inside of the horn with beeswax, as it makes warm beer (or water) taste better, and if you’re filling it with mead…even better. It will also take care of that less than pleasant horny smell. Fair warning, one has to beware when drinking alcohol out of a horn, because with no easy way to set it down without spilling your beer, you tend to go through it considerably faster. 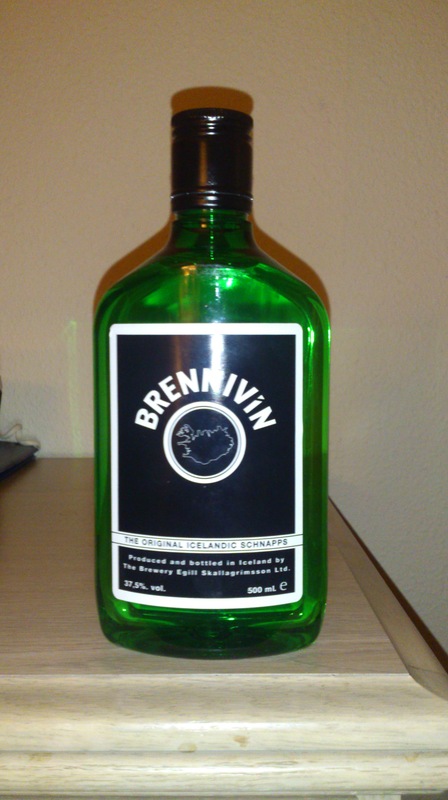 While we’re on the alcohol front, I also found a bottle of Brennivin, which I’ve been meaning to try for a good long while. Sadly, it’s the bottle that’s green, and not the liquor. It tasted a little like Sambuca. Not my favourite, but not unpleasant either. I’ve been told it’s better if served ice cold, so that’s something to look forward to, at least. I also bought dice. Quite a few of them. 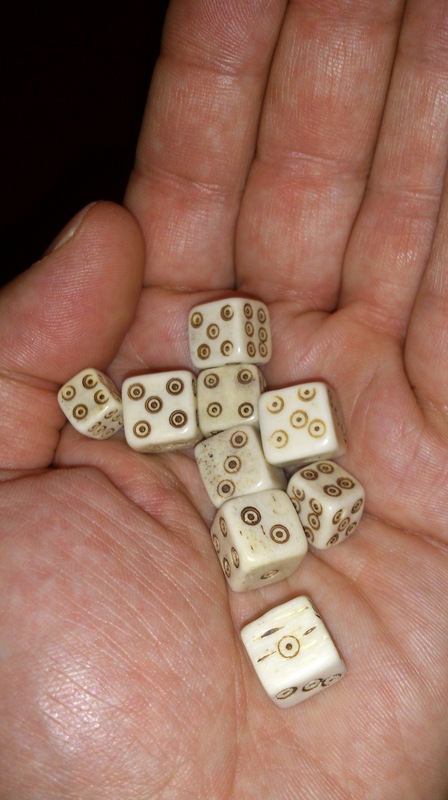 I’m not sure how true they’ll roll, but what gamer worth his salt could resist hand carved bone dice? Now if only I can convince them to make me some D20s! 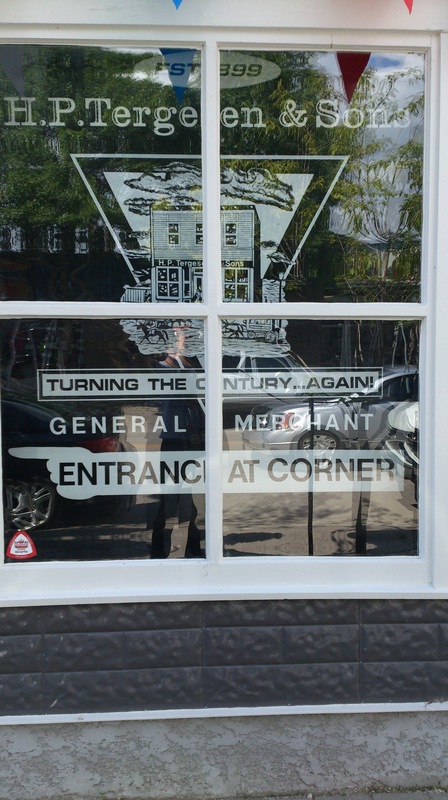 No trip to Gimli is complete without a visit to Tergesen’s, a store that has been around for parts of three centuries. Pretty cool! 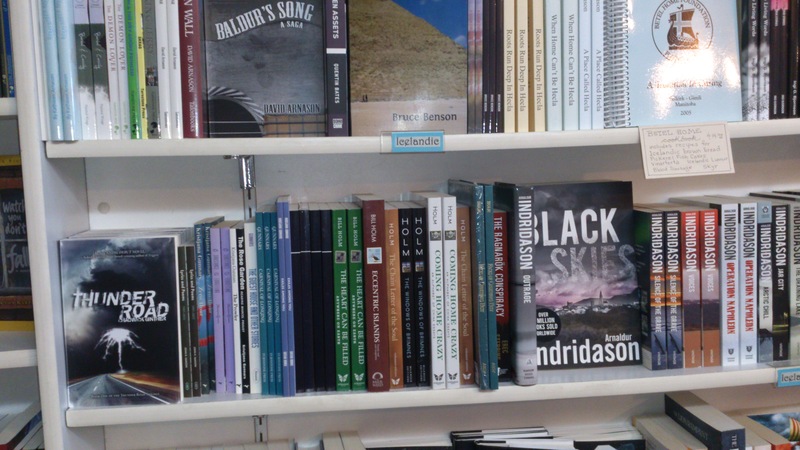 Even cooler, I found a bunch of my books on their shelves (and in the Icelandic section no less!). I signed all of their copies of Thunder Road, if you can’t wait to cross paths with me somewhere else. My readings went well, I read a couple scenes from Thunder Road that I don’t read all that often. And some that I’ve read more than a few times over the last year (Wendy says she’s got maybe one reading left in her of the scene where the dwarves tattoo Ted. And that’s probably fair.). The first question I was asked was why are there not two Ns in Odin(n) in Thunder Road, I’m not sure if they were satisfied with my explanation, but they bought the book. I also signed a copy of Thunder Road for a man named Bjorn and and a man named Kjali. So that’s definitely a win. 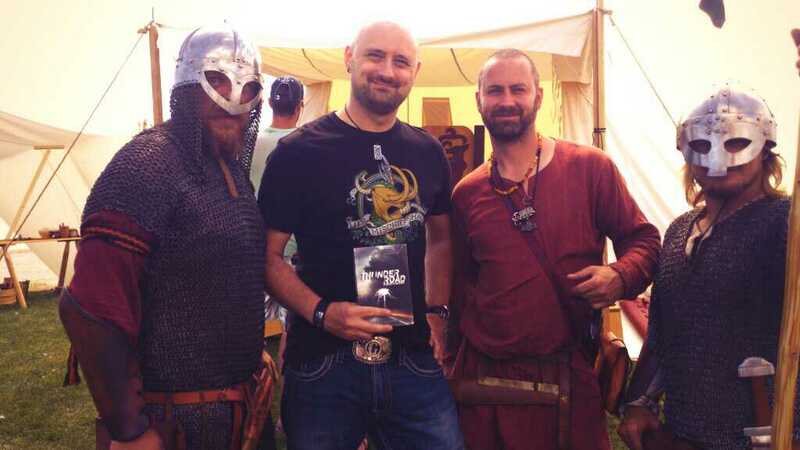 If I was more of an aggressive self promoter I would have handed out flyers for my readings in the village, but those folks were there to see the vikings. not me, and the vikings were “on the job” as it were. 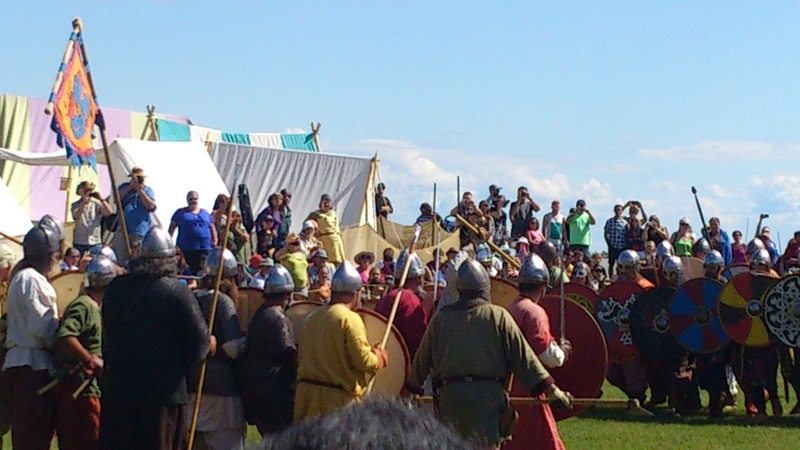 Still, I managed to get a few pics with some vikings. I saw the Prime Minister of Iceland, who is my age. Sigh. I’m not sure if that makes him young, or me old. I’ll split the difference and say both. I wasn’t able to get a picture with him, as he’s a busy guy. He’s a Prime Minister, after all, but it would have been cool to give him a copy of my book. I took in some of J.P. Hoe and Snorri Helgason. Two excellent performances! Snorri and his band were here from Iceland (in case that wasn’t obvious from his name) and I’m always amazed when I see singers who do not speak English as their first language, singing in it flawlessly (Hell, I can’t sing in English at all). I cut out of the concerts early, as I was more interested in a late night swim and a trip to the sauna. While this trip was a bit of a vacation, I also had a lot of work to do, so I spent my evenings reading, critiquing, writing (and watching bad movies–Sand Sharks and Dylan Dog, I’m looking at you). 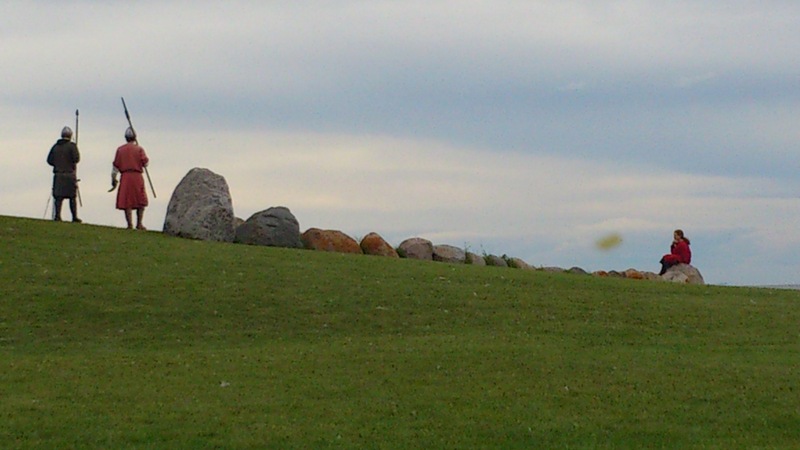 And I found a lot of writing prompts while I was in Gimli. I sketched out three short stories over the weekend, now I just have to find the time to write and polish them. Thank you so much to Michael Cichon for acting point to bring me to Gimli and to Tammy Axelson, Director of the New Iceland Heritage Museum for hosting me. Do visit the museum if you have the chance. 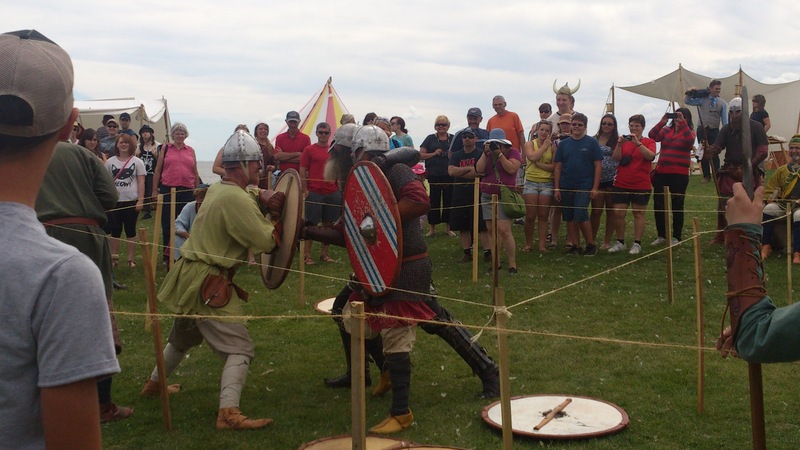 It was nice to spend more than a day in Gimli, I had a great trip! Also, I think that I can actually say Islendingadagurinn now. And…I have another great trip to write about soon (I promise!). This entry was posted in Uncategorized and tagged Brennivin, Gimli, Islendingadagurinn, JP Hoe, Odin's Ravens, Quicksilver Halo, Ship and Plough, Snorri Helgason, Sons of Fenrir, Tergesen's, Vinland Vikings by chadwickginther. Bookmark the permalink. I enjoyed the little trip. One glaring omission in the blog (and I’m going to blame finishing it late last night and posting it early this morning) was that I didn’t mention the visit from my family on Monday! My mom, two of my aunts, and two of my young cousins made their first trip to Gimli to take in my readings (and they brought friends!). I don’t talk about my family much online because most of them are not on Facebook, etc. and I want to respect their decision and privacy, but rest assured, they ARE awesome. Sounds like amazing writing inspiration. Love the pictures! Thanks! It was a great visit. I have some video of the combats that I might post later. I’ve been to busy to sort through it for video quality. Post the video!!! Great to have had you at the festival and thanks for taking the time to tour the village. I will! The village was brilliant, I’ll definitely be back next year.